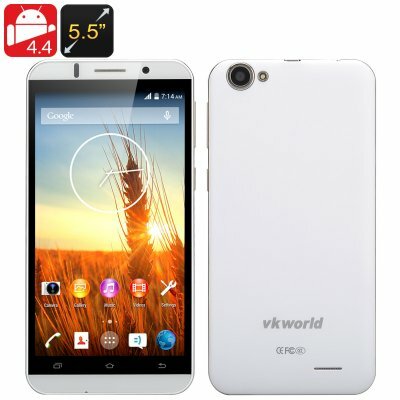 Successfully Added VKWORLD VK700 5.5 Inch Smartphone - MTK6580 1.3GHz Quad Core CPU, 1GB RAM, Android 5.1, 13MP Rear Camera, 3G, Dual SIM (White) to your Shopping Cart. The Vkworld VK700 comes with a 5.5 inch screen, an MTK6580 1.3GHz Quad Core CPU, 1GB of internal memory, 13MP rear camera, dual SIM and Android 5.1 operating system. Vkworld V700 is an Android phablet with a 1280x720 capacitive screen and a quad core CPU, which offer great media possibilities. A large bright screen brings with it great convenience in reading and writing messages and emails, as well as enjoying all sorts of media, from games to videos. The smartphone will also offer you advanced options when it comes to screen navigation and you will have geasture settings at your service, letting you draw a letter on your screen for quick access to a number of features. Despite the large screen, the phone is thin, compact and easy to operate, even when holding with one hand. Android 5.1 and Google Play Store will ensure a steady supply of the latest games and applications, while an MTK6580 Quad Core CPU will take care of speed and smooth operation. The Vkworld VK700 is well suited for both entertainment and keeping you productive in the workplace. With the support of two SIM cards, you have the option of having two phone numbers as well as creating two profiles for a more efficient use of your smartphone. With 3G connectivity, you will have access to your emails and the Web even with no Wi-Fi available. One of the notable features of the model is a high-resolution rear camera, coming with 13MP and letting you unleash your inner photographer. You may complement this feature by downloading a few extra photo editing apps for your smartphone from the Play Store and exploring the full range of possibilities of mobile photography. All you need now are some picture-worthy moments. This product is in stock now, we guarantee next working day shipping and offer a 12 months warranty on all our products. Brought to you by the leader in electronic devices as well as wholesale smartphones, Chinavasion. Many thanks For the excellent product and service you are highly recommended. Great product, fast, large display, great cameras, fair price, it has averyting I need. Did not find any at this point.